Thought GF “support” couldn’t get any worse? Seems like Gameforge is now limiting users to 5 tickets for every few days, and if you send one more they give a receipt acknowledgement as usual, “thank you for contacting blah blah”, but the ticket does not really get created, if you check tickets list it’s not there, it’s always a mystery whether a ticket you sent has been received and processed or not. Those that don’t make it (but they say as if it did), are lost forever while the users think their tickets have been received. Fixed the numbers formatting, it will display as 123,456 now overriding your regional settings. This was added a while back but never really worked. New feature: send hacker reports straight from ARM. This new feature only works for Gameforge at the moment, and it’s not thoroughly tested but should work fine. 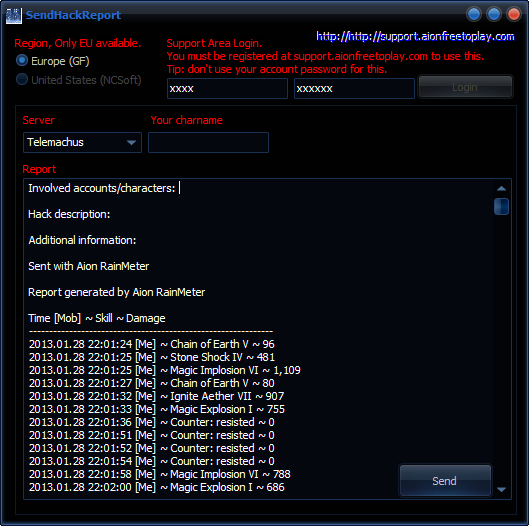 You can right-click on a player’s box and select “Send hacker report”, then ARM will fill in the data for you and ready to send, so you don’t have to go through their website and click a million places to send a ticket. You will need an account for the support area. I suggest you don’t use your game account password for this, as their support site is even less secure than their other areas. ARM simulates the entire brower/cookie etc process to send the tickets. Note also that Gameforge severely limits the amount of tickets you can send within a given amount of time, so it’s possible you send a ticket and it’s not really assigned anywhere. When this happens (either through ARM or their website), they give the same message “thank you for contacting blah blah” with no error or anything, but then the ticket does not exist when you check the history. Nothing changes, Gameforge staff are still harassing and unjustly banning their customer on a daily basis. A quick look on just the 1st page of the General forum.. a player posts a good-bye post: he gets banned (notice the lock on his avatar) because the staff don’t tolerate any criticism about their non-existent support. the game quality degrade day by day. The GF attitude I dont like. The support is not the right one, closing tickets with poor explanation or nothing. Many of you had to post here and ask help for your thicket, and this is bad. Part of his post was even removed by the corrupt mods who harrass the players everyday; every other user in the thread agreed on what he said. The mods again go on telling lies that the game “was more limited” with NC, when it’s all the other way around. Of course, if you try to question this, you get banned. and the gold pack has already been said it does not work for gold spammers or bots by far to many players to show you it does not work. Gameforge lacked security, it got alot of players hacked, wich is their fault and cost them a bit of reputation once more. Gameforge gives us only half the content of updates… Why? That’s the point, they won’t even give a valid reason, just some lame excuse. Item library/item descriptions when you loot. Some items didn’t translate from [item….] into their correct names, this is now fixed. On a little offtopic today, I’d like to mention this tunneling service I’ve been using since last summer. When Gameforge took over the NC Aion service in Europe, me and most players experienced a pretty big increase in ping/latency, making the game a painful experience often rather than the fun it used to be. Ping went up as high as 250-300ms with often even higher spikes and very unstable. I had been hearing about “battleping” for years but I was a bit reluctant about it, since I thought… well my ping is what it is, can’t really make it better unless a new ISP moves in etc.. but then I gave it a try after a few months and omg was I surprised. 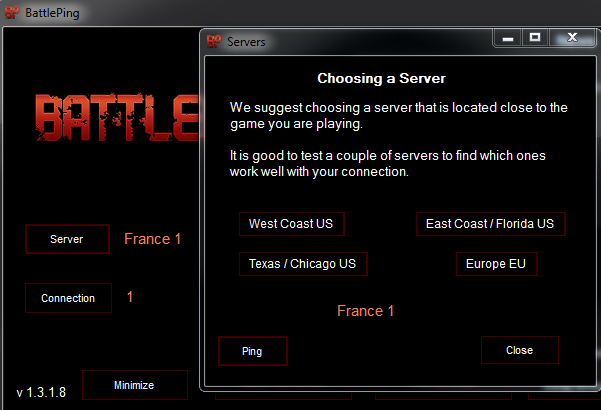 Note that this is different from “Leatrix” and similar software (ARM has the same feature), as those are simply a setting change in the Windows’ registry which in some cases does not help that much (still recommended you use it though in all cases); Battleping instead is an online service that connects you to the game through their servers. With this service my ping goes down to 80..90 ~averaging 100-120 at most, maybe peaking 150 at busy sieges. The difference is extreme, no more spikes, and even though it’s still worlds apart from those on 30-40ms.. everything feels a lot more responsive, my dps ramped up, it was easier to kite/chase in pvp, faster dispelling etc.. it’s like a whole different game, to the point I couldn’t imagine playing Aion anymore if I couldn’t use this service. Whenever I forget to start the program, I immediately feel something’s wrong and the game is more laggy than usual, it’s an extreme change. So if you are having ping issues, I recommend you give Battleping a try. Check the ping with the different servers to see which works best for you. In my case it’s France or UK, even though they recommend using the one closest to the game server, these 2 work better for me. If you want to play in US servers from Europe, the “East Coast 1” gave the best results for me, bringing ping from 400-500ms to a somewhat bearable 150-250, or else try the ones in Texas, as that’s where NC has their servers. This works perfectly also launching Aion from ARM, you should see a message in green on the window that says “Game detected” after the game is running. In the case of Windows 8, you probably won’t see the message until you reach the login screen. Note: there was some debate lately in the Gameforge forums as to whether using BP was allowed or not, because there were some recent bans stemming from its use, but in the most recent announcement they said it will be tolerated and they will not be banning anyone for using this service. The Battleping staff were in contact with GF to sort this out in the last few days. Technically the use 3rd party tools is regulated in our AGBs. Battleping qualifies as a tool that may not be used, based on the AGB. However, as with editing your client, we currently do NOT ban accounts for using the BattlePing tool. we currently do not have any specific plans to ban the use of BattlePing in the future. Possibly also bringing back hacker detection module and warnings. That’s a big slap in the face for people with jobs and more limited time for the arenas. Retarded decisions as usual by the biggest failure in the history of Aion publishers. Another account has been hacked under similar circumstances as what happened a while ago, where GF own staff are suspected of stealing player accounts. Almost 3 days gone by, the user has not received a single reply from support. Added support to parse stun godstone procs.